Each season, we make a list of everything we'd like to do and try to get it on our calendar so it actually happens! This summer flew by so quickly and there were a few things we missed out on, so we're trying to make sure that doesn't happen this fall! We sat down with a couple iced chai tea lattes to get ourselves thinking of fall, even though the weather was so warm, and made a list of everything we'd like to do this season! Decorate our home. 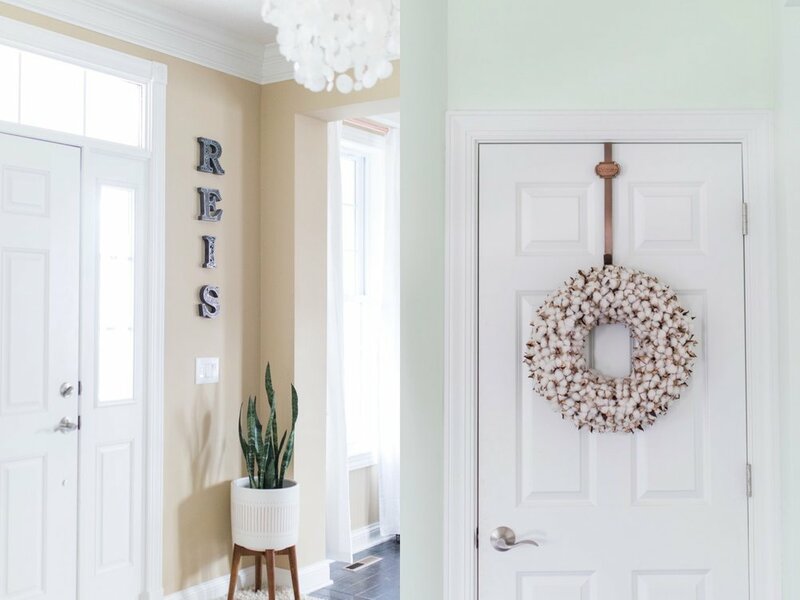 With each season, the first thing we like to do is switch up our home and porch decor. This really sets the tone for the season and helps me get excited for fall! I really love fall, but I love summer more and it's just SO hard to see it come to an end! Matt could live in a place where the only seasons they have are fall and winter. Done with this as well! I found a few more throw pillows that were hiding too! You can see more of our fall prep here. Give porch a fall update. 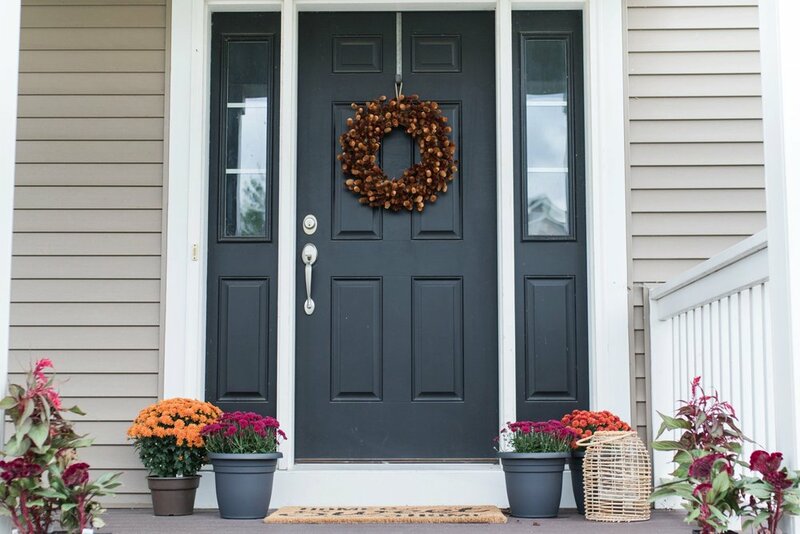 Pot some pretty fall flowers (thinking mums in a couple colors), pumpkins, and a wreath to decorate the front porch. Did this already, but still need pumpkins! Pick up some fall flowers. I always love picking up enough flowers to fill a vase or two. I try to only bring in flowers I know are pet (cat) friendly, as my kitties LOVE flowers, and I only keep them in places they can't get to, Right now, I picked up some beautiful sunflowers, sedum, and hydrangeas. 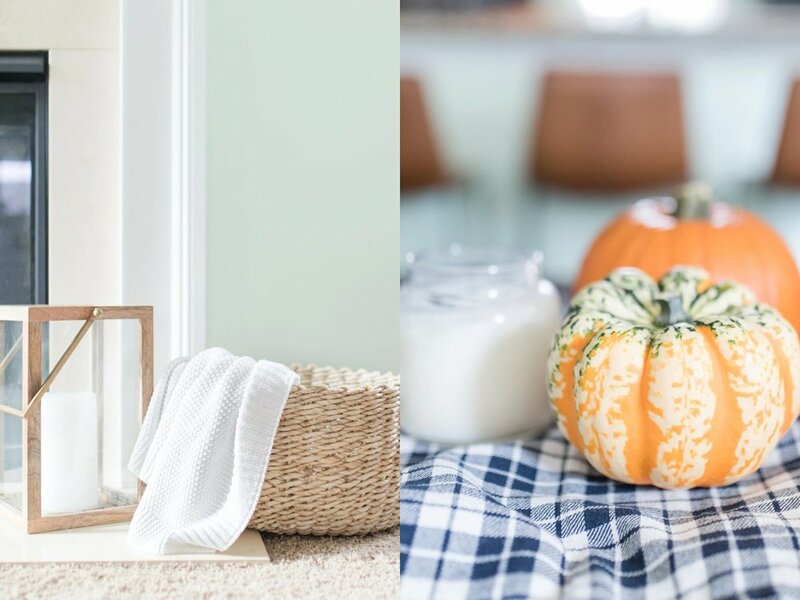 Add fall scents to our home to make it extra cozy. Purchase natural candles and fall essential oil scents to diffuse. Go to a pumpkin patch and carve/paint pumpkins. Place them on the porch and get them ready for trick-or-treaters! Last year we kept putting it off and never got around to carving or painting our pumpkins! Go to an apple orchard. Pick some apples, pet some farm animals, drink hot cider and eat mini donuts or another yummy treat! Plan a day date for a walk in a new park while the leaves are changing. Grab some hot cinnamon lattes and bring Sully for a walk in a new park together and out to dinner on a dog friendly patio while the weather is still nice! Scary movie night. Pick some movies to watch by the fire. Grab blankets, popcorn, and make some mulled wine or mulled cider. Pet costume photo shoot. Dress the pets up in their halloween costumes and take photos - because it's always pretty hilarious! Find new chili and soup recipes. Find a couple new recipes to try this fall - and actually make them! I've been wanting to make a roasted butternut squash + pumpkin soup and a cauliflower leek soup for a while! Chili is always so good too. And so is stew! Yum! Have a bonfire with s'mores! Plan this for a crisp, clear fall night to see the stars. Start a fall capsule wardrobe. I've been wanting to plan a capsule wardrobe for a while and I think now is the perfect time. It's officially fall! Who would have known? Here in Minnesota. our first fall day was 94° and very sunny, which I was totally okay with! It gave us a couple extra days in Matt's parents pool before they closed it up for the year! Now that it actually feels like fall outside and is likely here to stay, I'm trying to embrace this season and prepare for fall! With each season, the first thing I do is light a few candles, turn on the fireplace, open the windows, and switch up the decor in my home! 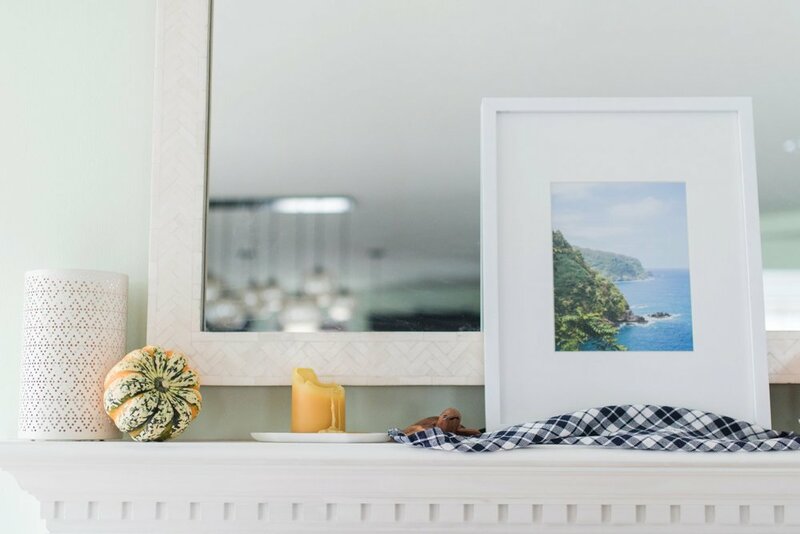 In the spring and summer my decor is bright, airy, and has a bit of a tropical vibe - perfect for the warm weather coming our way! In the fall and winter months I switch to anything that makes it feel cozy, comfortable, and inviting, since we'll be spending so much more time indoors. I used to decorate more for each holiday and felt like I was always having to put things up and take them down, sometimes keeping things up far longer than they should be and never really enjoying the process. It also always felt like there were too many knick-knacks around which isn't really my thing and certain holidays didn't match my home's style so they didn't blend with the other decor (lookin' at you 4th of July and Halloween). 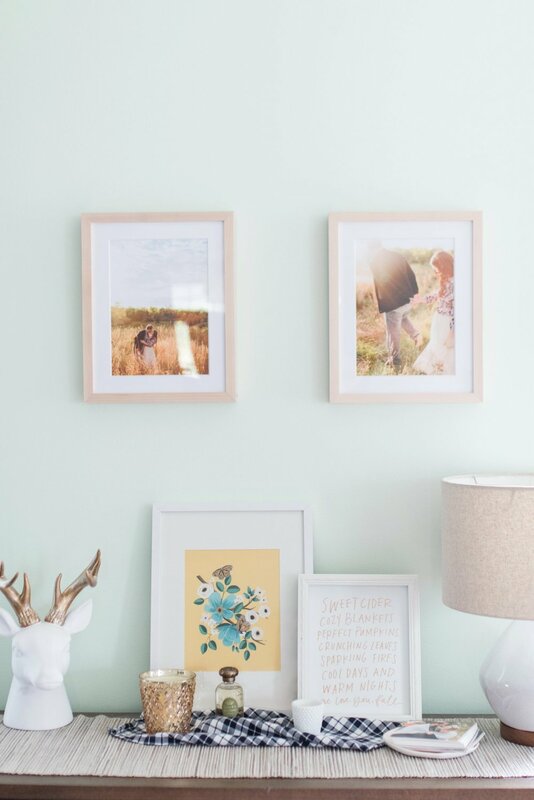 Prints: We switch out most of the photos/prints in our frames to fit the season. They may be family photos, photos we've taken while traveling, hand lettered wording, or other art prints. I keep a small box with all of our seasonable prints or previous photos we've used, then each season I go through them to see what I want to use! 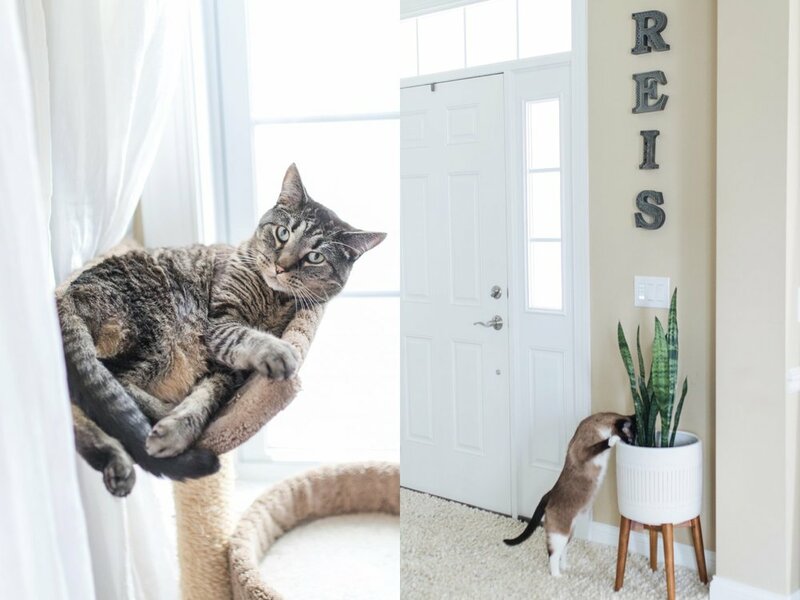 It's my favorite decor change and I think it's a great way to rotate your artwork so you don't get sick of it! It's also a great way to rotate your family photos so you get to see a lot of them on a regular basis! 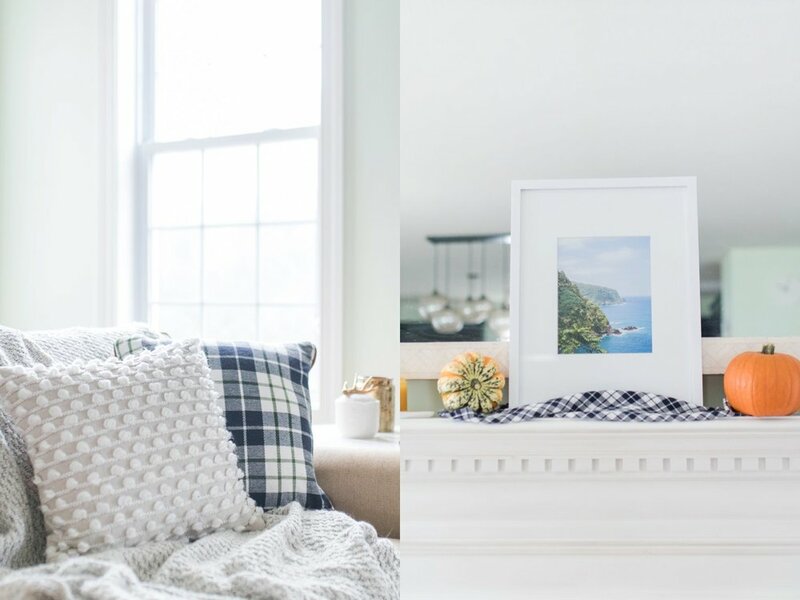 Throw Pillows: Our fall pillows are a mix of plaid patterns and white cozy textures. Throw Blankets: A couple plaid blankets and a couple light grey and white knitted throws. We keep the ones we like to use regularly on the couch and keep others in a basket by the fireplace which adds to the coziness. Fabric Napkins: These are excellent for adding in a pop of pattern anywhere around the house and definitely help make it feel cozy! We use them in the center of the table and put a candle and mini pumpkins on top, under items on the mantle, on an end table under a tray, etc. I buy all the same so there aren't too many different patterns around. They're so easy to switch out, store, or change if you get tired of a certain pattern/color. Fall Scents: I love getting new candles with cozy scents and using fall-like scents in our diffuser! I'm not one for overly heavy or typical fall scents (though I did find a pumpkin + nutmeg candle I love), but I usually lean towards more earthy, woodsy scents for fall such as: Bergamot, Amber, Fig, and Tobacco & Bay Leaf. Aside from making the house smelling amazing, I also love the ambiance candles create, especially when it gets dark so early! Fresh Flowers: I also love getting some fresh fall flowers or cutting some from my hydrangeas, sunflowers, or sedum outside! Turn on the fireplace: Turn on that fireplace and open some windows! During the day while it's cool, but not cold is a great time to get the fireplace running and burn off that weird smell after it's been sitting unused for months! And who doesn't love a burning fireplace. My FAVORITE part of fall and winter, and all my pets agree as well. The second it turns on, the cats suddenly like the dog and camp in front of the fireplace all day long! What do you do to get ready for the changing seasons? I'd love to hear in the comments! Get ready for our autumn bucket list blog post coming later this week!! Today I want to share an exciting update with you! While my website mainly focuses on photography (I sure hope that's your general takeaway from it! ), I have been working hard behind the scenes to bring you more content! Today, I'd like to share a new journey of mine - Beautycounter! I have been excited about Beautycounter for the past year or so, trying a few samples of products here and there at some fun pop-up shops around Minneapolis, and doing lots and lots of research. Let me tell you, I am a researcher. If I am interested in something, I dig in and spend way too much time looking into whatever it may be (traveling, food, health, products). In this case, it was Beautycounter and I just finally decided to take the leap and became a Beautycounter consultant! "Our mission is to get safer products into the hands of everyone." Throughout the past many years, I have been focused on changing my health habits to nutritious food, focusing more on real, unprocessed, organic, free range, and grassfed foods whenever possible. I have been switching personal care, laundry, and cleaning products for natural ones that actually work, with a lot of trial and error. This also applies to skincare and makeup. Everyone has their own skin concerns. Mine? Acne and sensitivity. Oh, how much I absolutely hate acne. I've been dealing with it forever and it has become even worse in my adult life. What? While there are other things I am working on internally with food, what I'm putting on my face definitely matters as well. Many natural products I've tried have been majorly lacking, even though I was so hopeful - they caused even more breakouts, left my skin feeling more oily, and the makeup was either super light and I felt like I had to put on multiple layers to even see a difference or it was super cakey and thick. I tried so many different brands and it would come off quickly and didn't look I had makeup on after 10am. I have found that Beautycounter works. My oiliness has come way down (even in the heat of summer! ), my skin seems brighter, more even-toned, feels overall so much more clean. The makeup is so great as well! Most days I prefer light coverage to help reduce the appearance of my acne and redness, some blush for a pop of color, and then I typically do my eyes as well. I am not typically one to put anything besides lip balm on my lips, however I have been using the neutral/blush color options in the lips sheers and glosses more and more! I love the color palettes Beautcounter offers, the make-up stays on throughout the day, and the products have the perfect amount of color when you put them on, and you can build on them if you'd really like a deeper color without them becoming to thick. Another quick note about the products I use. Since my skin is so sensitive and acne prone, I find it best to keep any products with coconut oil in them off my face (based on past trial and error). The rest of my skin does fine with it, so I have used it in body wash and hand lotion. If you have acne prone or sensitive skin, or have any type of food allergy, please make sure you read ingredients in any products you are using, or test small areas of skin for a couple weeks before covering a larger area with the product(s). Did you know that the personal care industry has very little regulation in our country? Companies are allowed to put in known toxins [ingredients] that are liked to hormone disruption, fertility issues, cancer, asthma, and more. And they aren't required to disclose these ingredients with you. Sounds wrong, right? Beautycounter is a front runner in the movement to create and educate about safe skincare and are committed to get high quailty, high performing, safer skincare and makeup in the hands of everyone. If you'd like to learn more about Beautycounter, take a look at their products, schedule a social (party), or purchase products, please visit my Beautycounter page. You can also use the Contact page or feel free to email me at sabrinasbeautycounter@gmail.com. I'm excited to share these amazing products with you! Another great resource I have found for determining safe ingredients (both in terms of health and acne/irritants) is COS DNA. Once you get to the website, click on 'analyze cosmetics,' copy and paste the ingredients list from any product from their website, and hit enter. There you can see the safety index (the lower the number, the safer the ingredient). Any acne or irritant (if your skin is acne prone or sensitive) you should be cautious trying anything over a 3. For safety, I would stay within the green or yellow, depending on why the ingredient is listed as yellow (mid numbers), and stay far away from red (high numbers). This session was so much fun lakeside at Lake Nokomis! This floating dock and the sailboats were such a fun setting! I haven't seen Rachel and Ryan since before their boys here born, which is crazy! Henry was such a great sport and laughed the entire time. Theo was a little shy at first, but eventually he came out of his shell after some fun playtime with dad! Oh my goodness!! How cute is little Scarlett? My best friend decided she wanted some fun photos of her sweet niece, so she booked one of my summer mini sessions at Lake Nokomis just for Scarlett. Let me tell you, it was SO MUCH FUN spending the entire time capturing this little girl giggling, running around, smelling flowers, and playing in puddles! My friend brought some simple props for her to use during the session and the flowers were definitely a fun and pretty addition to her photos! She also brought a blanket, which Scarlett sat on for approximately 15 seconds before getting up, but it was just enough time to switch things up a tad and give another look to the photos! She also brought her sweet little puppy to chase around, which made Scarlett giggle and laugh! I always encourage props for photo sessions and these were just the perfect addition to Scarlett's! I always want my clients keep an open mind about their session as well as the props they bring, as your little one (or the weather, or other factors) may have a different idea of how our session will go! If something isn't working, we'll switch it up and try something new! Simple props are always best and easiest to add into your photos!